Intestinal intussusception occurs when the bowel telescopes within an adjacent bowel segment due to discrepancies in localized bowel motility and is categorized by the location of origin. A portion of the mesentery and its vascular supply is oftentimes incorporated into the intussusception. Intussusception can be detected on palpation as a tubular soft tissue mass. Underlying bowel disease precipitates this lesion in many cases including viral enteritis and intestinal parasitism/infections in young dogs and neoplasia in aged dogs. 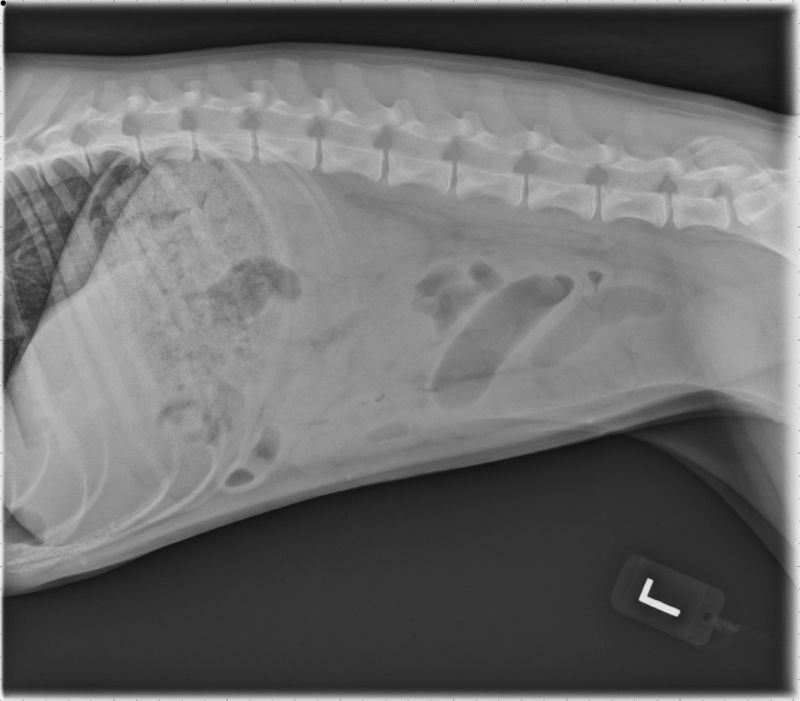 One of the most common sites for intussusception in young dogs is at the ileocolic junction (ileocolic intussusception). When suspected clinically, radiography should be performed to screen for intussusception and an obstructive pattern that would warrant surgery. When radiographs are not conclusive, positive or negative contrast gastrointestinal studies and ultrasonography (figure 1) can be performed for definitive diagnosis. 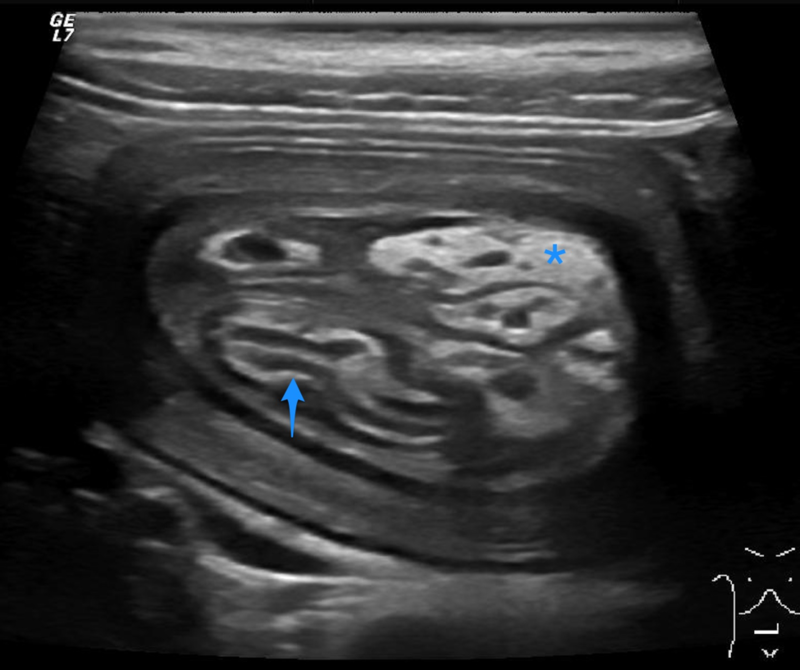 Figure 1: Transverse ultrasound image of an ileocolic intussusception. The ileum (blue arrow) is located eccentrically within the intussusception along with hyperechoic mesentery (asterisk) and multiple anechoic dilated vessels. The outer intussuscipiens is thickened with indistinct wall layering most likely due to wall congestion and edema. Many intussusceptions on plain radiographs can appear as segmental or multisegmental soft tissue opaque bowel dilation with mass effect and absence of bowel gas; however, these findings cannot be discerned from other obstructive bowel lesions. A highly specific radiographic roentgen finding for intussusception is called the meniscus sign (or crescent sign). This is crescent shaped-gas in the bowel lumen (intussuscipiens) that surrounds the apex of the intussusceptum (invaginated segment) creating a well-demarcated soft tissue/gas interface (figure 3). 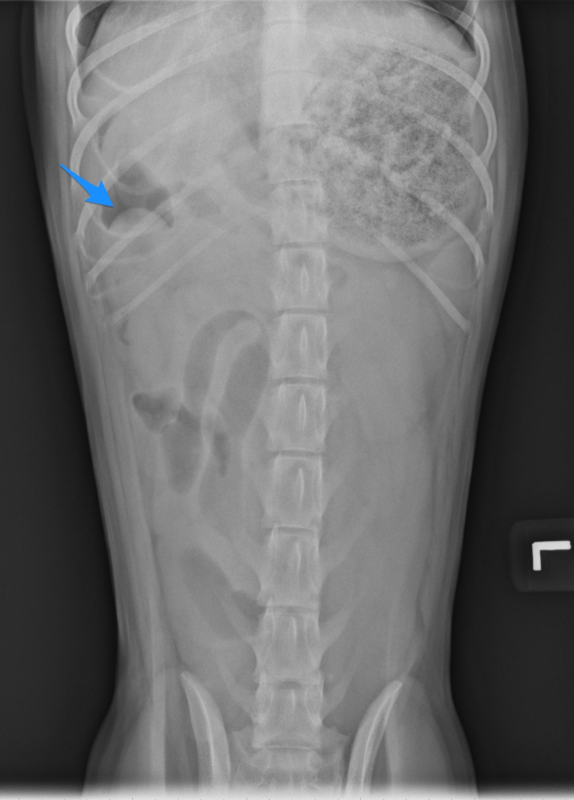 Figure 2: Left lateral view of a 6-month-old female spayed Golden Retriever presented for a one week history of abdominal pain, vomiting and diarrhea. Stacking, dilated small bowel segments are evident centrally indicating mechanical ileus. Figure 3: Ventrodorsal views of a 6-month-old female spayed Golden Retriever presented for a one week history of abdominal pain, vomiting and diarrhea. On the ventrodorsal view, a meniscus sign is visible at a bowel segment in the right cranial quadrant consistent with intussusception. Stacking, dilated small bowel segments are evident centrally indicating mechanical ileus. The target sign is another specific roentgen finding reported in human radiography that is characterized by a round soft tissue bowel mass with internal concentric lucencies reflecting the invaginated mesenteric fat in the center of the intussusception. In my experience, the meniscus sign has been observed on multiple confirmed intussusception cases although its detection requires careful examination of the bowel gas as it can be easily overlooked.